Learn how to manipulate data, and construct and evaluate models in Azure ML, using a complete data science example. Large-scale machine learning, or predictive analytics, is having a powerful impact across many industries. By using machine learning, companies, governments, and not-for-profits are replacing guesses and seat-of-the-pants estimates with valuable data-driven predictions. Deriving value from machine learning, however, is often impeded by complex technology deployments and long model-development cycles. Fortunately, machine learning and data science are undergoing democratization. Workflow environments make tools for building and evaluating sophisticated machine learning models accessible to a wider range of users. Cloud-based environments provide secure ubiquitous access to data storage and powerful data science tools. 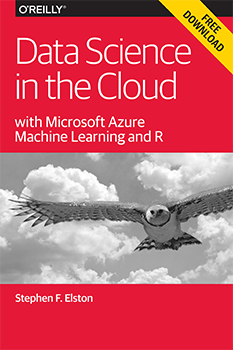 To get you started creating and evaluating your own machine learning models, O’Reilly has commissioned a new report: “Data Science in the Cloud, with Azure Machine Learning and R.” We use an in-depth data science example — predicting bicycle rental demand — to show you how to perform basic data science tasks, including data management, data transformation, machine learning, and model evaluation in the Microsoft Azure Machine Learning cloud environment. Using a free-tier Azure ML account, example R scripts, and the data provided, the report provides hands-on experience with this practical data science example. The dataset and R code used throughout the report are available on GitHub. Free tier Azure ML accounts are now available with a Microsoft ID. This post is part of a collaboration between O’Reilly and Microsoft. See our statement of editorial independence. Article image: Sand storm (source: Wellcome Library).